Frank and Jennie were enumerated in the 1920 West Springfield, Hampden Co., MA, federal census, ED 189, page 25B. He was a farm manager, age 47, she was 44. The only child in the household was William A., age 7. Sisters Catherine 51, and Etta 42, were also in the household, both single. 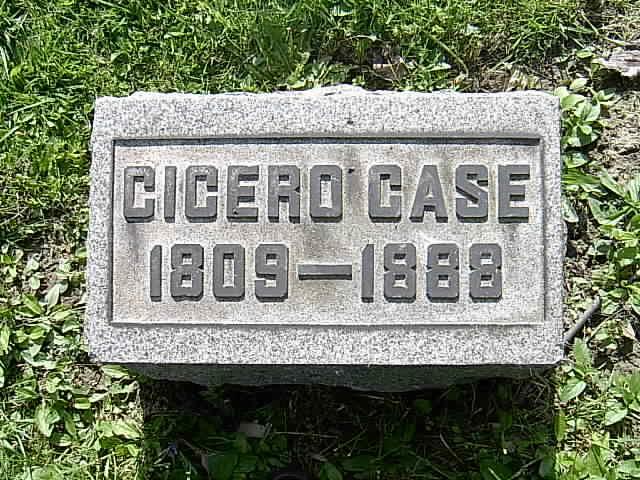 Cicero Case was born on 6 January 1809 at Granby, Hartford Co., CT.1 He was the son of Capt. Abner Case and Phebe Smithson.1 Cicero Case married Nancy Marienna Hungerford, daughter of Harvey Hungerford and Olive Martindale, on 16 February 1841 at Trumbull Co., OH.2 Cicero Case died on 6 October 1888 at Cortland, Trumbull Co., OH, at age 79.2 He was buried at Disciples of Christ Cemetery, Cortland, Trumbull Co., OH. Cicero and Nancy were enumerated in the 1850 Bazetta, Trumbull Co., OH, federal census. He was a boot and shoe maker, age 42; she was 29, born in Ohio. Children in the household, all born in Ohio, were Abner 8, Lewellyn 6, and Emma 4. There was a Rachel Striker, age 14, in the household, with no relationship indicated. Cicero and Nancy were enumerated in the 1860 Bazetta, Trumbull Co., OH, federal census, page 127, dwelling 1007, family 978. He was enumerated as "Israel." He was a shoemaker and farmer, age 50; she was 39, born in Ohio. Children in the household, all born in Ohio, were Abner 18, Llewellyn 16, Emma P. 14, Melissa 9, Adelbert 7, Francis 3, and Dwight 1. Cicero and Nancy were enumerated in the 1870 Bazetta, Trumbull Co., OH, federal census, page 18. He was a shoemaker, age 60; she was 49. Children in the household were Adelbert 17, Francis E. 14, and Dwight 11, all born in OH. Also in the household was the family of daughter Emma P., married to Eugene (?Lattis) a farmer age 32; she was 24 and they had a daughter Carrie E., age 10/12. Cicero and Nancy were enumerated in the 1880 Bazetta, Trumbull Co., OH, federal census, ED 183, page 5. He was a shoemaker, age 71, she was 59, born in OH. Children in the houehold were Dwight, age 21, and Francis and his family. Francis was a farmer, age 23; his wife Lillian was 22, born in OH. They had a son, Eddie, age 1, born in OH. [S101] Ruth Cost Duncan, John Case, Page 93. [S396] Richard D. Case, "Abner Case." Nancy Marienna Hungerford was born on 2 September 1820 at Fulton, Trumbull Co., OH.1 She was the daughter of Harvey Hungerford and Olive Martindale.2 Nancy Marienna Hungerford married Cicero Case, son of Capt. Abner Case and Phebe Smithson, on 16 February 1841 at Trumbull Co., OH.2 Nancy Marienna Hungerford died on 26 October 1904 at Cortland, Trumbull Co., OH, at age 84.2 She was buried at Disciples of Christ Cemetery, Cortland, Trumbull Co., OH. Llewellyn and Mary were enumerated in the 1900 Townville Borough, Crawford Co., PA, federal census, ED 42, page 12 B. He was the postmaster, age 54; she was 52. The census indicates he was born in Aug 1845 in OH. They had been married 34 years and had 5 children, 4 of whom were still alive. The only child in the household was Ray, age 17, born in PA.
Abner N. Case was born on 16 November 1841 at Hartford, Trumbull Co., OH.1,2 He was the son of Cicero Case and Nancy Marienna Hungerford.1 Abner N. Case married Deborah Lattin, daughter of Benjamin Lattin and Esther Simmons, on 26 September 1867 at Courtland, Trumbull Co., OH.3 Abner N. Case died on 3 November 1919 at Champion Twp., Trumbull Co., OH, at age 77. He was buried at Hillside Cemetery, Bazetta, Trumbull Co., OH. Abner's death certificate shows his birth as 16 November 1842. Emma Phoebe Case was born on 5 July 1846 at OH.1,2 She was the daughter of Cicero Case and Nancy Marienna Hungerford.1 Emma Phoebe Case married Eugene M. Lattin on 25 December 1866 at Courtland, Trumbull Co., OH.3 Emma Phoebe Case died on 24 August 1928 at Cortland, Trumbull Co., OH, at age 82. Eugene and Emma were enumerated in the 1870 Bazetta Twp. Trumbull Co., OH, federal census, in the household of her father, Cicero. Carrie was their only child. Eugene and Emma were enumerated in the 1880 Courtland Village, Bazetta Twp., Trumbull Co., OH, federal census, ED 183, page 7. He was 42 and worked in a brickyard; she was 33. Children in the household were Carrie 10, Alzene 4, Edson F. 2, and an unnamed son born in May 1880. Eugene and Emma were enumerated in the 1900 Courtland Village, Bazetta Twp., Trumbull Co., OH, federal census, ED 94, page 10A. He was 62, she was 53; they had been married 33 years. Children in the household were William B., 20, and Florence(?) age (?). Also in the household was Emma's mother, Nancy, age 79. Emma was enumerated in the 1920 Cortland Village, Bazetta Twp., Trumbull Co., OH, federal census, ED 246, page 1A. She was a widow, age 73. Also livng in the household was the family of Isaac Matson(?). Melissa Case was also known as Alicia Olive Case. 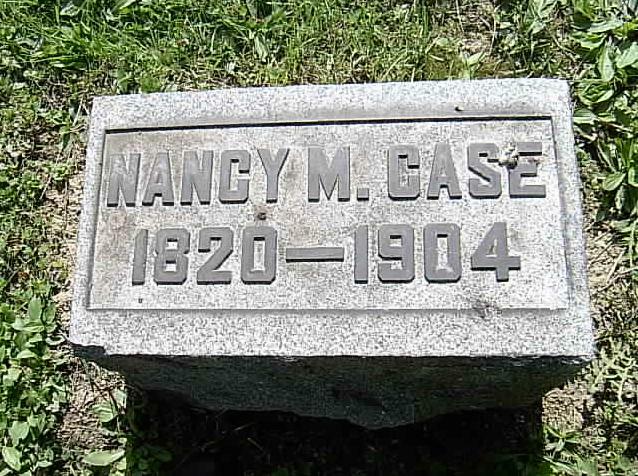 She was born on 10 December 1850 at OH.1,2 She was the daughter of Cicero Case and Nancy Marienna Hungerford.1 Melissa Case died on 29 April 1884 at Delaware, OH, at age 33. 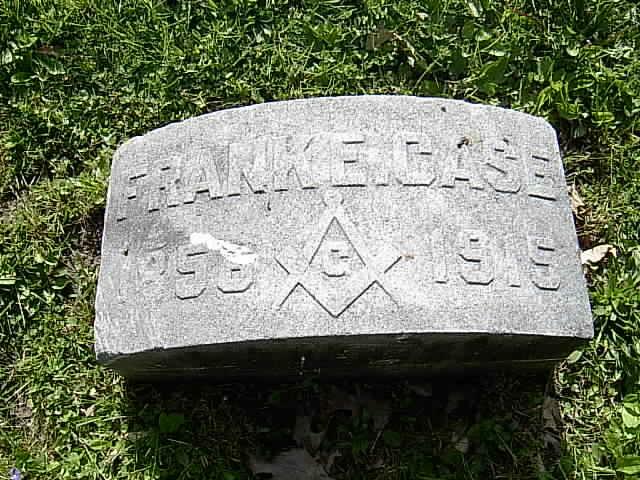 Francis Edson Case was born on 8 September 1856 at Bazetta, Trumbull Co., OH.1 He was the son of Cicero Case and Nancy Marienna Hungerford.1 Francis Edson Case married Lillian Herrick on 2 July 1876 at Cortland, Trumbull Co., OH.2 Francis Edson Case died on 17 June 1915 at Dayton, Montgomery Co., OH, at age 58. He was buried at Disciples of Christ Cemetery, Cortland, Trumbull Co., OH. 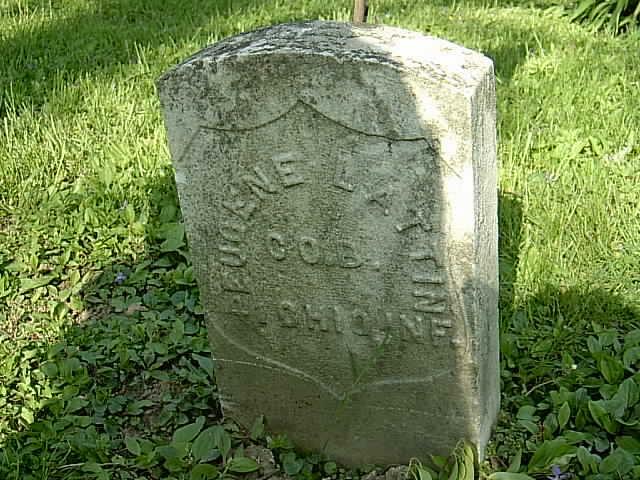 Eugene M. Lattin was born in March 1838 at OH.1 He married Emma Phoebe Case, daughter of Cicero Case and Nancy Marienna Hungerford, on 25 December 1866 at Courtland, Trumbull Co., OH.1 Eugene M. Lattin died on 7 August 1910 at Courtland, Trumbull Co., OH, at age 72. Deborah Lattin was born on 19 December 1835 at Binghamton, Broome Co., NY.1 She was the daughter of Benjamin Lattin and Esther Simmons. Deborah Lattin married Abner N. Case, son of Cicero Case and Nancy Marienna Hungerford, on 26 September 1867 at Courtland, Trumbull Co., OH.1 Deborah Lattin died on 16 February 1914 at Bazetta, Trumbull Co., OH, at age 78. She was buried at Hillside Cemetery, Bazetta, Trumbull Co., OH.